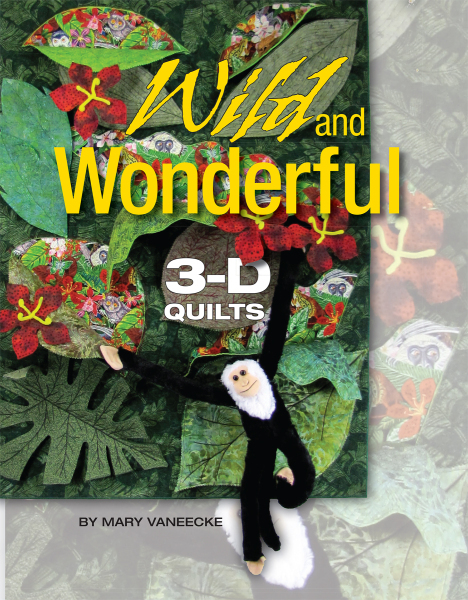 It has been a busy winter in the studio and a lot has happened since Wild and Wonderful 3-D Quilts debuted at Houston Quilt Festival last fall. For starters, Brewer Sewing is now distributing the book to quilt shops. Ask for it at your local quilt shop. Individuals can buy the book from me at Amazon.com for the full $14.99 sticker price. (click here for more information) I want to support local quilt shops and won’t undercut their prices online. The National Quilting Association’s Quilting Quarterly will publish its book review this spring. I hope to bring my 3-D quilting classes online later this summer. Stay tuned for details. My friend Lea McComas and I are making plans to promote our books at Houston Quilt Festival again this year. It’s a Jungle Out There will be touring with the Studio Art Quilt Associates Wild Fabrications show, and Houston will be the first stop on the tour. The National Quilting Association’s Quilting Quarterly will review my book in its next issue. How cool is that? Last but not least, I am going to the Chicago Quilt Festival this month to demonstrate my techniques at the free Open Studios booths on Thursday, March 26, and Saturday, March 28. Superior Threads will be selling Wild and Wonderful 3-D Quilts at the show, along with all their gorgeous threads.